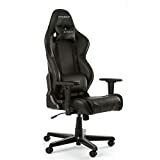 DXRacer Racing Series ▷ Size & Buying Guide on GOTURBACK.UK! The DXRacer Racing Series is the perfect gaming chair for the slim and average-sized person. The Racing Series is a sporty seat with a design that is reminiscent of a racing car seat. It cannot get more attractive than that. It is a sturdy and buff chair with just the right proportions for a comfortable gaming experience. With a price close to the best, it is an excellent and affordable luxury gaming chair. The Racing Series is a quality chair made of quality material for longevity and comfort. It has a 50kg/m3 high-density mold shaping foam similar to a regular car seat. Interesting to note is that the Racing Series seat is a patent race car seat. This feature should tell you how long you can sit with the seat maintaining its original form. This sturdy chair also has a steel frame and an aluminium base, so you are assured of durability. The base is made durable of nylon meaning no breakage is expected long after purchase. This synthetic material is durable and flexible, the perfect material for the base. The chair has a PU leather covering and silent, floor-friendly 2” PU casters. PU is an excellent choice for protective equipment and casters because it is smoother and more durable than PVC. No changing will be required no matter how long the chair has been in use. The chair’s ability to recline is at 90-135°. If you are the type of guy who likes to take a nap after a long game, this is just the chair for you. If you want some freedom with your seat, you can also tilt it down to 17°. For the restless gamers, the Racing Series has little footrests on each leg, the ultimate definition of comfort. What’s better than a chair that is utterly relaxing, One that is healthy. The Racing Series ensures that you do what you love without hurting your body. It is ergonomically made, meaning you can game for an extended period without stressing your back, neck, and wrists. The armrests are 2D/3D adjustable, and the backrest is extra high to prevent neck and back pain. The chair features a class 4 SGS certified gas lift for height adjustment. With the help of the control unit, you can rock back and forth or entirely lock the chair in the desired position. The DXRacer Racing Series has a variety of designs and colors to best suit your needs and preference. Whatever the choice, the Racing Series chair does not disappoint with its performance. The chair comes with lumbar and neck pillows for extra comfort. Speaking of comfort, you can buy DXRacer footrests and sit back and kick it while you play your favourite game. Rollerblade casters are also available with different sets of colors at an affordable price. As an addition for 2D armrests, a mouse tray is available for purchase and may come in handy. One of my favourite accessories is the laptop or tablet tray that is robust and stable and does come into good use. The recommended user weight for the Racing Series is 180 lbs and height is 5’11”. The chair can accommodate users who are up to 6’1” and 265 pounds, but they will not be comfortable. In fact, anyone surpassing the 200 lbs mark would be uncomfortable. Furthermore, the materials used to design the chair may be susceptible to wear and tear if maximum seat weight is exceeded. However, it is a tough, beautiful and is easy to assemble chair that is healthy and durable.